Though pedestrians have the right of way at intersection crosswalks, this is not the case when crossing the road at places other than a crosswalk. If a crosswalk is available, pedestrians are required to use it to cross the road. 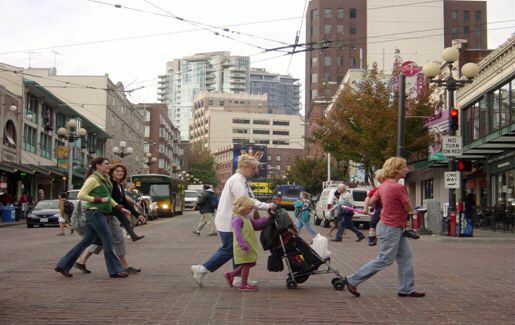 However, if a pedestrian is crossing, for example, in the middle of a block away from any marked crosswalks, then she must yield the right of way to all motor vehicles. However, if a driver sees a pedestrian in the middle of the street, that driver is still charged with a duty to perform all reasonable steps to avoid hitting that pedestrian. For example, even though a pedestrian may be negligent for crossing at a place other than a crosswalk, the driver may also be negligent for speeding or not paying sufficient attention to avoid hitting that pedestrian. This is a situation that illustrates that the rights of way belonging to the motorist and the pedestrian are not absolute but relative, depending on the facts of the incident.